My usual blogging time is early Saturday morning while my kids are just waking up and my hubby is out on an early ride with his bike club but last weekend we were camping making the most of the glorious spring weather in Texas. Of course a WIP came too, as it always does. I am working on the extremely cute bobble vine jacket by Edie Eckman with the last of my bargain Cascade Alpaca Lana D'Oro stash yarn. I love crafting outdoors with my dog by my side in a beautiful peaceful setting accompanied by the sound of nature. I've even taken it so far to entice friends to learn to crochet while camping with us when I needed my teaching hours for my crochet certificates - a captive audience. Poor things. Read my post The Joy of Crafting with others for photographic evidence. I thought I'd peruse the web for others fond of knitting and crochet in the great outdoors. What are the best outdoor projects? 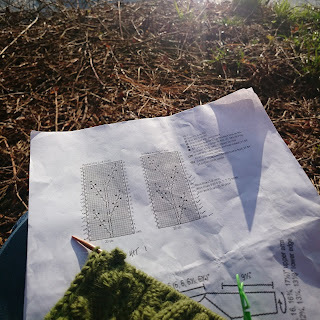 I found some extremely sensible advice on the Knitpicks Blog: 3 favorite projects for the great outdoors These are #1 portable socks, #2 modular projects such as squares for a blanket and #3 finishing off. Where is a good place to crochet outdoors? Rachel Choi of the CrochetSpot blog suggest a number of good places to crochet outdoors in her article 6 fun places to crochet outside. Love it! Actually found a book about knitting projects specifically for camping. How fun! Check out In the Woods: 20 Projects for the Great Outdoors by Shannon Okey. Yes I do have this book, a Christmas gift from one who knows me well. It's adorable. Let's Go Camping! : Crochet Your Own Adventure by Kate Bruning Reminiscent of vintage camping memorabilia, create a nostalgic collection of crochet projects encompassing all aspects of outdoor life ranging from vintage caravans and ice cream trucks, to tents and teepees with all the camping paraphernalia of sleeping bags, backpacks and a log fire, as well as mountain and forest scenery. This started in 2005 and WWKIP Day is unique, in that it’s the largest knitter run event in the world. Each local event is put together by volunteers. It's coming up on Saturday 18th June and here are all the details about how to get involved. Hope you're now feeling inspired to take your yarn projects outside! Let me know if you do!